Just in time for a friendly Christmas competition with Amazon's Kindle Fire, Barnes & Noble is announcing the release of its competitor, a Nook Tablet. Just in time for a friendly Christmas competition with Amazon's Kindle Fire, Barnes & Noble is announcing the release of its competitor, a Nook Tablet. The Fire got insane reviews. Some bloggers were so impressed they even ventured to call the Fire "an iPad killer." Now that Barnes & Noble's throwing its tablet into the ring, will it be the Kindle Fire Killer? Here's how a duel might shake out. 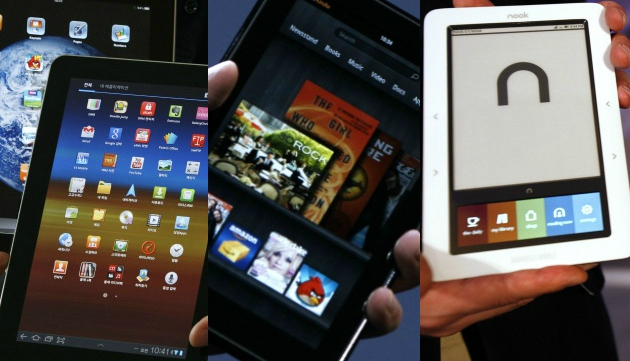 Amazon's betting on all the great entertainment its Kindle Fire will offer. It's even losing money on the actual device because its thinking it will make more selling the content that will play on its cheap fun-machine. Since the Kindle Fire announcement, Amazon's been beefing up its offerings, opening its Lending Library service just yesterday and adding streaming contracts to its 13,000 title library. Barnes & Noble has said the Nook Tablet will basically be the Nook Color with "HD Entertainment," we'll have to wait until the official announcement to see how hooked up it will be. Winner: Kindle Fire, for now. The iPad's the prettiest tablet around, and the Kindle Fire didn't really try to compete. It basically looks like the very unpopluar BlackBerry playbook, which TechCrunch's Matt Burns found pretty unimpressive, calling it characterless, dull and just passable. If the Nook Tablet looks like the Nook Color, it should please. At least for an e-reader, the Nook Color impressed. Endgadget's Joshua Topolsky called it "elegant," but that was as an e-reader, perhaps the standards are different for tablets? Below you can judge the iPad, Kindle Fire and Nook Color look, respectively. The Kindle Fire pulls put just ahead of the Nook, taking the prize. But perhaps with the official announcement next Monday, Barnes & Noble will pull out a secret weapon, providing a reason to spend the extra $50.